Despite strong preseason performances from Xavier Ouellet, Alexey Marchenko & Nick Jensen, it looks like the Red Wings will keep the same defensive corps for the 2014-15 NHL season. Ouellet leads the team in ice time, averaging 24 minutes a game, and has the best plus-minus rating with a plus-4 mark. If anybody has a chance to crack the six-man rotation it’s him. Red Wings head coach Mike Babcock is equally impressed. Unfortunately, still, all signs point to him being sent to Grand Rapids when the season begins. He just doesn’t have the experience level of Niklas Kronwall, Jonathan Ericsson, Danny DeKeyser, Brendan Smith and Kyle Quincey. The only way Ouellet would start the season with the winged wheel on his jersey is if the team decides to trade Jakub Kindl or waive Brian Lashoff. Last week, Babcock said that Lashoff wasn’t in trouble of losing his job. Seeing as how the injury bug had its way with the Red Wings last season, the team and fans alike should all agree that keeping Lashoff is in Detroit’s best interest. He played in 80 of the team’s 87 games last season, with four of those missed games being a healthy scratch. All along, the Red Wings have maintained that they wouldn’t keep a seventh defenseman, so it appears that Jakub Kindl could be the odd man out. It wouldn’t be much of a surprise as he’s struggled this preseason following a tough 2013-14 season. Well, here we are again. Like their NFL counterpart, the Detroit Lions, the Red Wings failed to upgrade their defense. They let Kyle Quincey walk only to bring him back because nobody new wanted to come to Detroit. So now Jimmy Howard again has to pick up the slack, and be the last line of defense, if the blue-liners fail to stop the puck from moving. Now don’t get me wrong. Howard is a good goaltender. But like any other good goaltender, he can only stop so many shots. Eventually one will get by, more than likely off of a rebound. 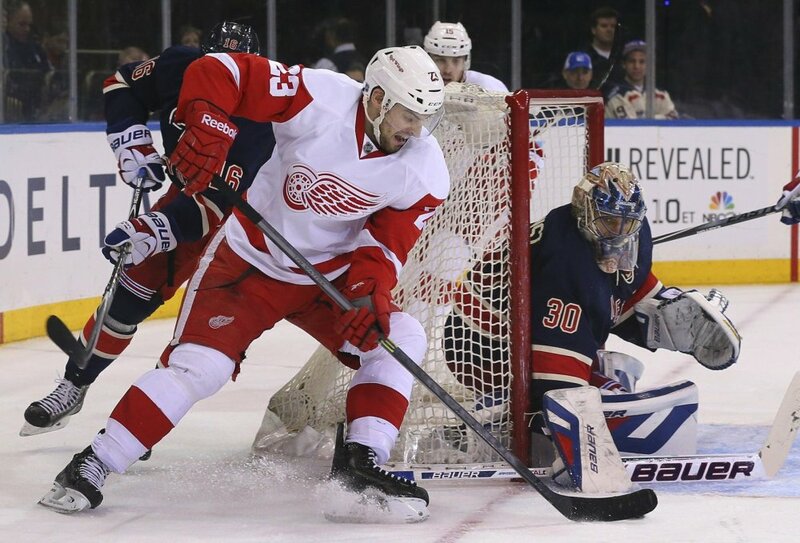 At the very least, the Red Wings have to concentrate more on the rebounds. They can’t expect Howard to do everything all by himself. One goal, off of a rebound, could be the difference between a win and a loss. This time it could be the difference between 24 straight playoff appearances, or cleaning out the locker room with the other 14 teams that didn’t make the postseason. Being the professional that Jimmy Howard is, however, he puts some of the onus on himself to improve his stats and the team’s performance.